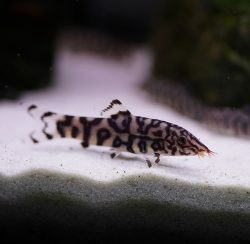 A lot of people are growing interest in fish keeping as a hobby. However, only a genuinely passionate aquarist is going to think about expanding his fish tank. If you are one of those people who are getting serious about fish keeping, you might think of getting a bigger aquarium. You know what you need? A 75 gallon fish tank. You may be planning of getting a bigger species of fish. Perhaps you are considering getting more of the species you already have to add to the family. Either way, you must make sure that you choose the best 75 gallon fish tank there is. However, choosing the best 75 gallon fish tank is not as easy as you think it is. I mean, yes, there are a lot of 75 gallon fish tanks for sale. The problem is that each one of them claims to be the best. That does not sound right, does it? And you cannot just get the first 75 gallon glass aquarium you see! But don’t worry. We are here to help you make your choice of the best 75 gallon fish tank. Are you ready? Let’s begin. There are a number of things to consider before choosing which of the best 75 gallon fish tanks is best for you and your fish. First and foremost, think about what kind of fish and how many fish you are planning to get. Is a 75 gallon fish tank really a good accommodation for your the size of your fish and its quantity? Second, think about placement. Do you have enough space at your home to locate the 75 gallon fish tank? Third, understand how nitrogen cycle works on high-volume tanks. 75 gallon fish tanks need more maintenance than the smaller sized ones. Also consider the right filtration equipment, sterilizers, aquarium, lighting, heater and thermometer. The Innovative Marine Nuvo 75 Gallon Aquarium and APS Aluminum Profile Series Stand is perfect for aquarists who are into functionality and style. This rectangular fish tank is made of diamond edged ultra-thick high clarity low iron glass panels. It comes with an innovative built in overflow that has a triple drain system. The overflow and three drains allow for unobtrusive landscaping and reduce accidental spillage, blockage, and noise. 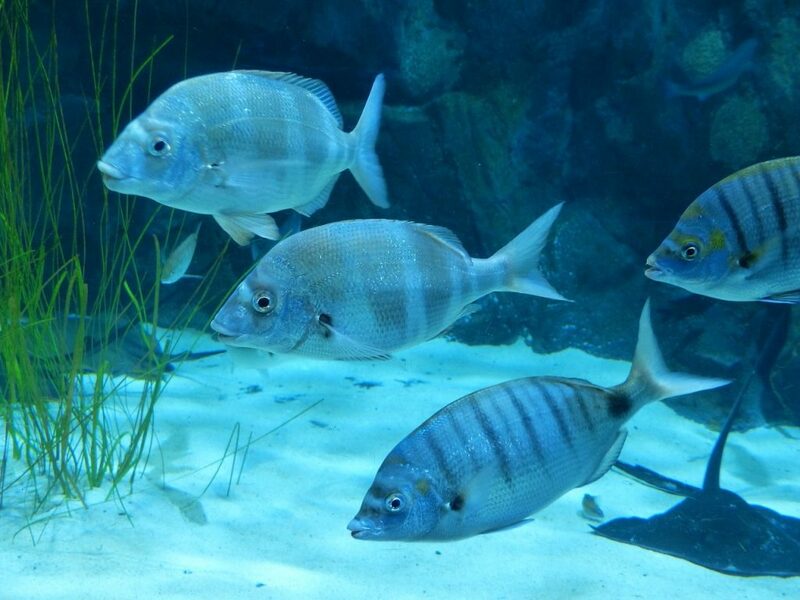 It also safeguards fish from any accidental overflows outside the tank. The aquarium is also equipped with a Pro Series screen lid, which is excellent for plant life. It comes pre-drilled with holes and plumbing, and is completely silent, efficient and fully customizable. 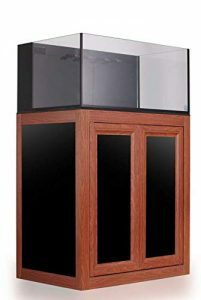 The Innovative Marine Nuvo 75 Gallon Fish Tank also comes with its very own cabinet stand that comes in two finishes. The first (pictured above) is the wood finish. The other option is a clean matte black finish. This may be the best 75 gallon fish tank with stand for sale. To top it all, it features a distortion-free glass which makes aqua scaping more fun. This 75 gallon aquarium with stand is also a little more expensive than the others, however, the quality and attention to detail is bar none the best. This fish tank is best used as either a 75 gallon saltwater aquarium or 75 gallon freshwater aquarium. The fish tank dimensions are 35.4″L x 23.6″W x 19.7″H and the stand dimensions run 35.68″L x 23.5″W x 35.81″H. The recommended return pump size for this is 750-1500 GPH. If you are looking for durability, Seapora 56216 74 Gallon Edge Series Aquarium Reef Ready is the one for you. This square aquarium is built to endure any pressure. This fish tank has tempered glass that gets rid of glass bowing due to its durability and security. Now you do not have to worry about any kind of distortion while you marvel at your fishes. The Seapora Square 74 Gallon Aquarium can be easily assembled. It functions best if you do not fill the tank to its maximum capacity. Once set up correctly, it can bring a whole new look to the room. Black colored aquarium frames blend well to all kinds of interior design. This aquarium is made with the best glass, the Opti-Pure, which is glass technology that allows for the clearest views of your beautiful aquarium. 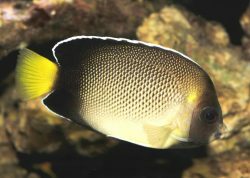 You’ll see your bright and beautiful fish along with its great decorations clear as day. The only issue is that the Opti-Pure glass is only on the front panel, so make sure to put it the right way for you and your guests to view is important, but definitely not hard. Overall this is a solid aquarium if you need something taller than wider. The Seapora 56216 74 gallon fish tank is habitable by freshwater and saltwater fish. 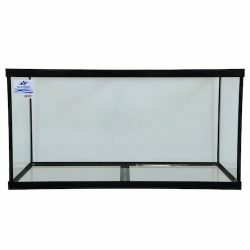 The fish tank dimensions are 24″L x 24″W x 24″H. If you are looking for a fish tank made of the most quality materials, go for Seapora 56218 75 Gallon Edge Series Aquarium which also comes in a reef ready version, the Seapora 56217. This product goes through inspection that complies to the highest industry standards. Seapora 75 Gallon Aquarium Kits are part of the Edge Series which offer tempered glass panels for added durability and security. This fish tank is also designed with a lot of regard for aesthetics. The commercial grade black silicone sealant makes the look a lot cleaner and at the same time prevents capillary action and leakage. But take note, the sealant is not as permanent as the other parts. The best feature is probably the Opti-Pure Ultra clear glass which makes the fish viewing experience better. However, this special glass is only built for the front side of the fish tank and not on the back and sides. 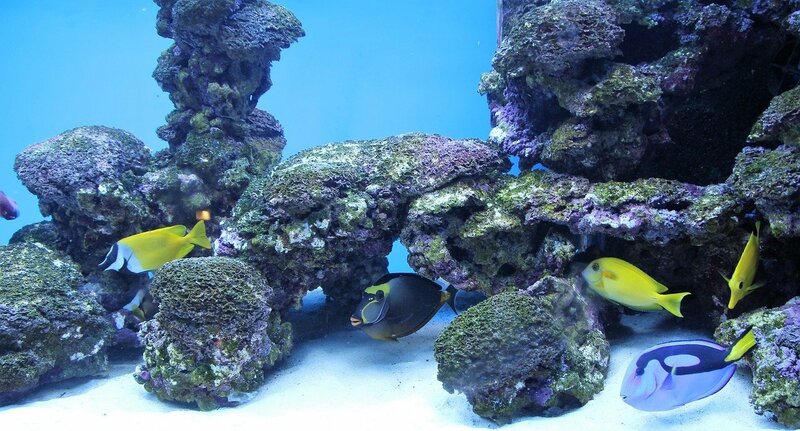 This fish tank is great for freshwater or saltwater, and has a reef option if desired. The dimensions are 48”L x 18”W x 20”H. 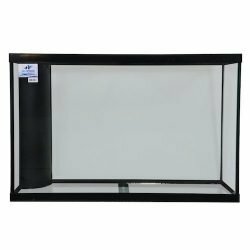 The Aquarium Masters AM13076 75 Gallon Acrylic Aquarium is a rimless fish tank that features a bottom framed with black silicone seals. Black silicone seals acts as a stopper to avoid water leaks and passageway action. Also, its edges are polished by diamonds to ensure safety from anything sharp and dangerous. This aquarium is made with the highest quality materials (professional grade). If you prioritize functionality, this is the best 75 gallon fish tank for you. It is compatible to a lot of different kinds of filters may it be internal, back, and canister. It also works with many different kinds of lighting systems. 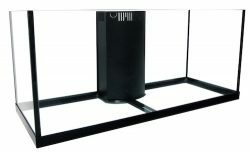 The Aquarium Masters AM13076 75 Gallon Acrylic Aquarium passed the standards set by the quality assurance regulatory board so rest assured that your fish is in a very good tank. The glass panel for this fish tank is made with Opti-Pure glass. It is very popular for its precise manufacturing origin. It is a highly robust glass that can enhance your aqua scaping experience. The glass is also anti-reflective so if on-screen imagery is important for you, this is the best 75 gallon fish tank in the market. However, it would have been great if the glass was built on all sides of the fish tank and not just on the front. You might also need to get a replacement lid in the future, but since the glass fish tank is made in accordance to industry-standard sizes, you would not find it difficult to find one. And that’s it! We have narrowed your options down to four to make it easier for you to choose the best of the 75 gallon fish tanks. All you have to do now is choose one out of the four that fits your specific needs the most. Remember: A 75 gallon fish tank is not the same as buying a small fish bowl for your first gold fish. Getting a 75 gallon aquarium for sale is a big deal that requires a lot of thought before buying. When you finally decide to get one, you must have patience, commitment, and responsibility to maintain it. Did you enjoy reading this article? I hope we were able to help you pick the best 75 gallon fish tank for sale for your fish. If you have anything in mind that you would like to share, write a comment below and let us know what you think.